While I work on some longer posts, allow me to share a favorite postcard from the collection. Meet McKinley of Farmingdale, Maine, who tipped the scale at 35 pounds. I assume that he was named after President William McKinley (1897-1901), who weighed in at about 235 pounds. 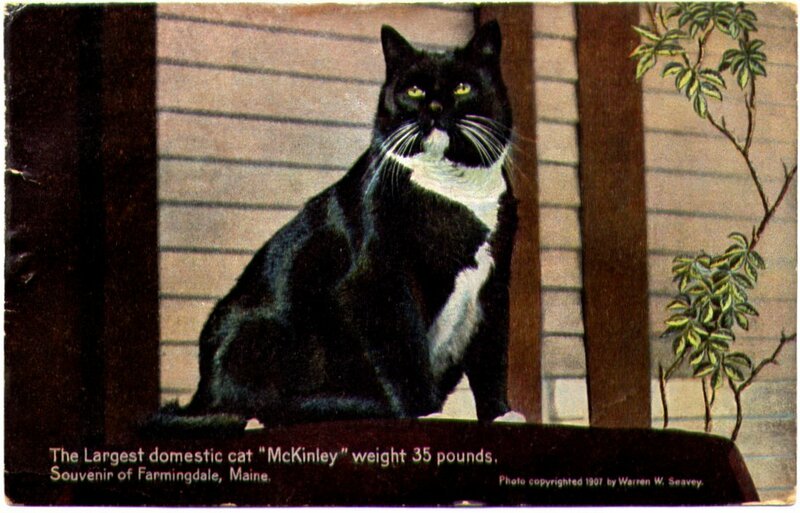 Perhaps McKinley the cat should have been named Taft; that president was much heavier (over 300 pounds). His name may have been inspired by President McKinley’s untimely death at the hands of an assassin. The town of Farmingdale, Maine, was known for its ice industry in the late 19th century. Growing large cats seems to have been an unheralded sideline to the local economy. I’d love to know the back story of McKinley’s portrait; how did anyone know that this very handsome fellow was the largest domestic cat? Perhaps there was a competition of some sort. (Pause to imagine this event in the context of other civic booster activities in the early 20th century — delicious!) If you come across any information on this feline McKinley and the competition for largest cat in the U.S. (or the world for that matter), please share it with us all! That is a BIG cat….the largest domestic cat that I have ever seen weighed 22 pounds.